Until our new building is approved for occupancy, we are meeting for Sunday services at the North Cape building at 2885 Commerce Parkway in North Port. Signs will direct you in from Toledo Blade Boulevard. Our Sunday service times are 9:30, 10:30 am, and 6:00 pm. Our Wednesday night Prayer Meeting and Bible Study is at 7:00 pm. Please give us a call at (941) 456-2267 to find out the location for this week's Prayer Meeting. A Welcome From Bethel Baptist Church! 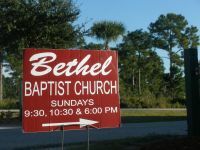 Shining the light of the Gospel in southern Sarasota County, Bethel Baptist Church has faithfully served the North Port community and surrounding area as an independent, fundamental Baptist church since its inception in September of 2002. Guests who join us for worship and fellowship will find our people to be a growing, friendly, and vibrant congregation. We desire to be characterized by the love of God, Spirit-empowered preaching, and a Bible stand for holy living. We believe in worshipping the Lord with spiritual conservative music and the time-honored King James Version of the Bible. Anyone looking for a church that seeks to serve the Lord by following God’s Word, the Bible, will be right at home at Bethel Baptist. Adult Bible study, along with Sunday school for all ages, begins at 9:30 am. The main service and Children's Church are at 10:30. The evening service begins at 6:00 pm. A nursery/toddlers room is available for all services. Wednesday night prayer meeting and Bible study is at 7:00 pm.